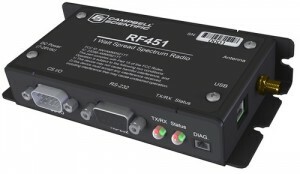 The RF451 consists of a radio module manufactured by FreeWave Technologies and a Campbell Scientific interface board. It is a spread spectrum radio that provides a solution for wireless network communications over distances up to 85 kilometres. The radio's transmission distance is ideal for point-to-multipoint networks. In point-to-multipoint networks, data is collected from one or more datalogger(s) and then transmitted to a central site. The central site typically contains a PC running LoggerNet software, but may contain a datalogger, instead. Spread spectrum radios spread the normally narrowband information signal over a relatively wide band of frequencies. This process makes communications more immune to noise and interference from RF sources such as pagers, cellular phones, and multi-path. User-selectable frequency hopping patterns reduce the radios' susceptibility to RF interference from other spread spectrum devices.